With Ramadan and Eid travel behind us, we may have to try just a bit harder to convince our clients to travel abroad. But as the temperatures keep soaring and the summer holidays kick in, so do people start dreaming of that much-needed break. Here are some ideas to tickle your wanderlust, and your clients’. Take a journey of self-discovery and innate happiness in the Himalayan kingdom of Bhutan – a place of natural beauty and cultural authenticity. 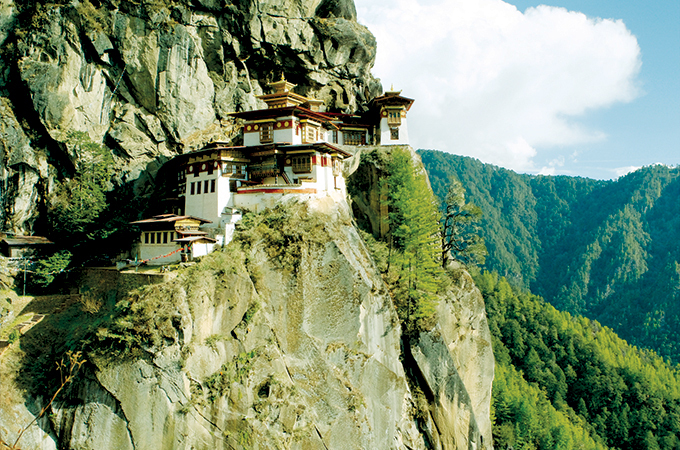 Aman was the first international hotel collection to be granted permission to operate within the borders of Bhutan. Amankora's five intimate lodges (Paro, Punakha, Gangtey, Bumthang and Thimphu) facilitate a kora, or 'circular journey' of discovery throughout central and western Bhutan. Amankora guests can choose a journey including all or a combination of these lodges, and enjoy exceptional cuisine, cosseting spa treatments, one off cultural encounters, unique sightseeing and breath-taking adventures in nature. Amankora has introduced helicopter transfers between lodges, a series of Michelin­ starred chef residencies at Thimphu Lodge, a unique helicopter breakfast experience at Twin Lakes, forest and prayer flag bathing experiences, immersive wellness retreats with visiting specialists, four new suites and a swimming pool at Punakha Lodge. Experience the morning sun gilding over Bhutan's second highest peak, Mount Jomolhari, during a sumptuous breakfast in the crisp morning air. A short helicopter ride from Amankora Paro takes guests up the Paro Valley over lush forests and remote hamlets before embracing stunning panoramic views of the Himalayas along the Bhutan-Tibet border. After breakfast, guests can explore sacred sites nearby. There is much more to the Maldives than splashing around in the water. The island nation can truly be a delight for the gourmet traveller as six resorts in Baa Atoll come together to celebrate food with the first-ever Baa Atoll Summer Festival 2018. Soneva Fushi, Four Seasons Landaa Giraavaru, Dusit Thani, Amilla Fushi, Vakkarau Maldives and Finolhu put their best ladle forward in the event, which will be held from July 20 to August 3. The name’s Bond, James Bond. Live the life of the British secret agent at this budget blowing experience in Phuket, Thailand. 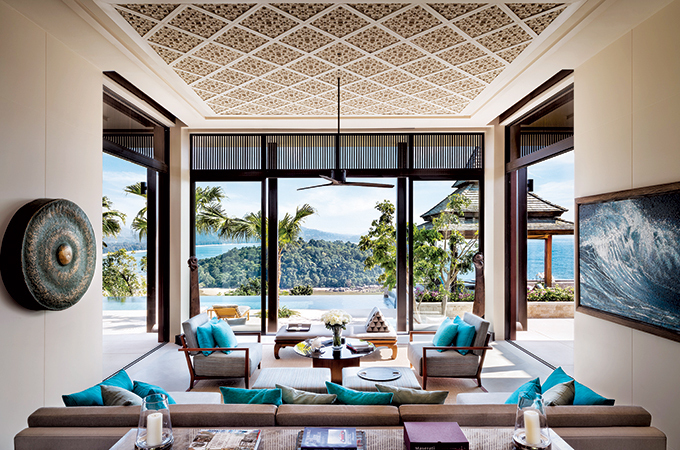 The Layan Residences by Anantara in Phuket has launched an ultra-luxury Golden Gun experience inspired by James Bond movie The Man with the Golden Gun. From flying in by private jet to handling the original golden gun from the 1974 film, this no-expense-spared escape is packed with thrilling VIP experiences. The adventure kicks off in fabulous style as guests board a private jet from Bangkok to Phuket, before being whisked by chauffeur-driven limo to Villa Similan – the largest of the resort’s 15 ultra-luxurious residences. This extravagant experience also includes a glamorous yacht cruise around Phang Nga Bay, where the movie was filmed, during which guests can sip free-flowing beverages and tuck into a gourmet barbecue prepared by the onboard private chef. Back at the villa, guests can develop their Ninja skills with a private Muay Thai boxing lesson. They can then soak up the views over the Andaman Sea as their butler serves 007’s signature dry Martini cocktail (shaken, not stirred) before heading to the cinema room for a private viewing of vintage James Bond films, reliving the iconic secret service agent’s escapades as he outwits nemeses around the world. Prices start from TB1,100,000 ($33,533++) for two people excluding tax and service. Have some dirhams to spare? Head over to the best five-star hotel in Switzerland. 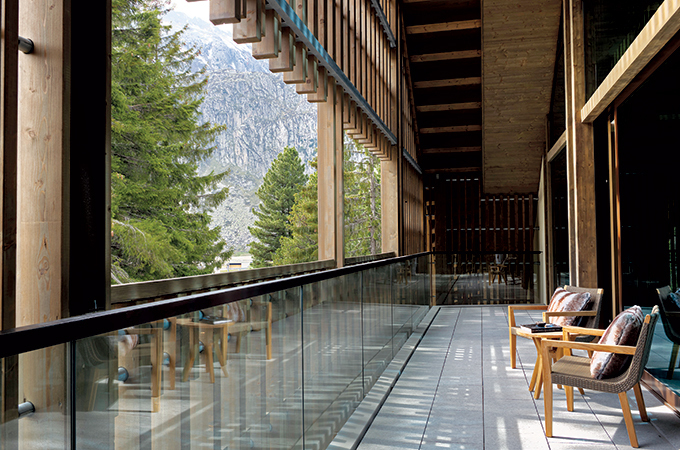 In his book The 150 Best Hotels in Switzerland, renowned journalist and author Karl Wild has named The Chedi Andermatt, Switzerland's Best Holiday Hotel in 2018/19. The property was designed by renowned architect Jean-Michel Gathy of Denniston Architects, and opened in 2013 in Andermatt, Switzerland. The Chedi Andermatt offers over 123 elegant rooms and suites with a perfect combination of alpine chic and Asian expression. Located in the heart of the Swiss Alps at an altitude of 1447 metres above sea level, the property provides unique service with immense attention to detail. The 2400 square metre Spa & Health Club creates soothing moments with your taste buds extremely satisfied by culinary delights in The Japanese Restaurant, recipient of one Michelin star, and The Restaurant, recipient of 15 GaultMillau points. Want to stay in a palace like kings or queens did? 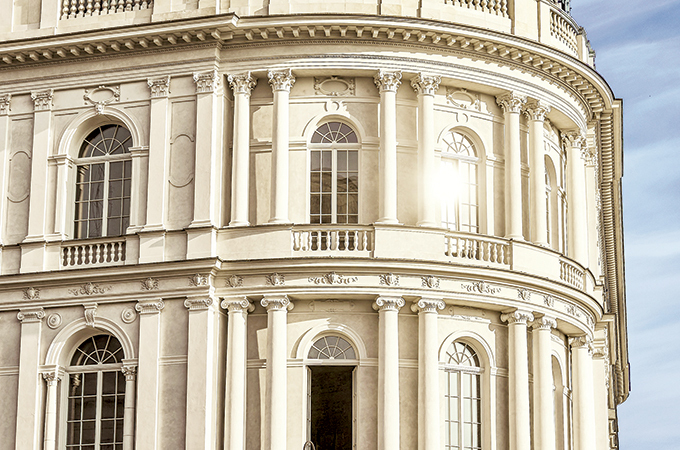 Enjoy a stay in Raffles Europejski Warsaw, Poland. Dating back to 1857, the neo-renaissance palace built by Enrico Marconi and renowned as a Grand Dame of European hotels during the 19th century, Raffles Europejski Warsaw has been restored to its pre-war glory. It brings over 160 years of history and heritage to the culturally rich Raffles Hotels & Resorts brand. The Hotel Europejski Art Collection consists of almost 500 artworks created by more than 120 artists. The 106 rooms and suites are classically stylish with blackened oak floors, contemporary Polish art, a corner library and sleek marble-clad bathrooms with Art Deco touches. But the jewel in the crown is the Presidential Suite, spread over a magnificent 293 square metres, and home to a 19th century piano, a reminder that this room was once host to recitals and piano concerts in another chapter of its rich history. The hotel offers a variety of culinary options and serves modern Polish cuisine with a twist. The Raffles Spa is the biggest and the best in Warsaw with six treatment rooms, complete with Technogym and an upstream indoor swimming pool. The emphasis is on holistic wellbeing. The lives of the famous and glamorous will no longer be a mystery, with the multi-million-pound relaunch of Sunset Tower this August. Led by owner Jeff Klein, who has owned the West Hollywood property since 2004, the Art Deco masterpiece is located on Sunset Boulevard and has been an exclusive hub for the Hollywood elite since opening its doors in 1931. The updated design will reveal elegant, stylish new interiors, a beautifully designed Terrace Bar, a fresh outdoor terrace and swimming pool plus wellness area. The chicest and most welcoming room in town – The Tower Bar and Restaurant – will remain untouched. Residents included Truman Capote, Jean Harlow, Clark Gable, Greta Garbo, Joan Crawford, Errol Flynn, Marilyn Monroe and Elizabeth Taylor. Sunset Tower’s 81 bedrooms and suites have been decorated in a chic and elegant style. The Terrace has been reborn, with a dark and glamorous new bar in the same style of the famous Tower Bar, as well as a separate indoor/outdoor restaurant, which is connected to the swimming pool and quintessential LA vista beyond. The rates at Sunset Tower start from $425 on a room-only basis. For travellers who love to take striking travel photos, Mandarin Oriental Pudong, Shanghai, offers a unique tour of the city’s fast-fading history. The hotel concierge can introduce guests to award-winning Shanghai photographer Gangfeng Wang for a three-hour photo tour of the charming but fast-disappearing historic laneways of Shanghai where he grew up. Guests will enjoy a rare insight into local Shanghai life while discovering how best to capture fascinating scenes on camera. It really comes at a bargain at CY1,200 ($185) per person for the three-hour tour and a set of exclusive Shanghai post cards. On returning to the hotel from their tours, guests can unwind at the spa, with experiences like Tuina massage by traditional Chinese medicine therapist Newman Cheng. 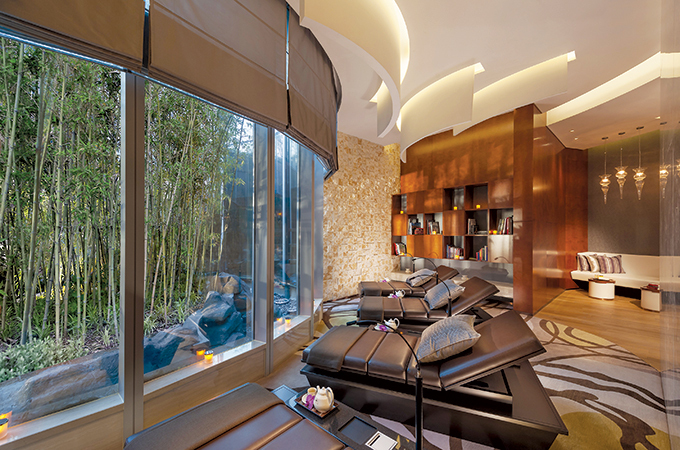 Mandarin Oriental Pudong, Shanghai is also offering guests a complimentary third night package. When booking the hotel’s One More Night offer, guests will enjoy Suite or Club room accommodation with a third night’s stay free, giving them more time to explore Shanghai’s arts scene, architecture, artisan quarters and cultural legacies on one of its new tours. Additional benefits include Club Lounge privileges. The One More Night package is available from CY2,400 ($371) per room per night and is subject to 16.6 per cent service charge and taxes.